Pakistanis are NOT "indians":There is no such thing as the "South Asian race" or "brown race" or "desi race"
The Indian propaganda machine has alot of pseudoscience supporting it's favor. This pseudoscience can be on many lines weather historic distortion, science (genetics in this case) or other political propaganda to erase the identity of other South Asian nations and discredit them while Indians credit themselves. Many Pan-South Asian Indian propagandists and their partners in Bangladesh, Pakistan like to propagate the people of South Asia as being "one race." Their method of spreading their propaganda is very easy and it follows Adolph Hitlers strategy of speak a lie, keep repeating it and everyone will believe it. This is exactly how the Indian/Hindutva propaganda feeds itself aside from using misleading terminology or deliberately misquoting scholars to fit their own political agendas. Coming back to the subject of genetics where Pan-South Asian Indian propagandists and Hindutvas have tried to convince the world that Nepalis, Pakistanis, Bangladeshis and others don't exist as a race and are just part of the "Indian race" or the "South Asian" race and carry the same genes. Using actual haplogroup reports of Y-Chromosomes & mtDNA in Southern Asia let us examine how true their claims are. -Y-chrosome(s)=Genes passed on from father to son. A male individual's maternal linage cannot be traced using Y-chromosomes as it's strictly based on a father-to-son linage. -mt DNA= Genes passed on from mother to daughter. If a female human were to determine her fathers ancestry, she'd need Y-chromosome samples which she can only obtain from a brother, an uncle or another close male relative. Since females do not posses Y-chromosomes, it cannot be used to determine a father-to-daughter genetic linage. -J1= Haplogroup of Semitic people whom are Natives of the Arabian peninsula as well as those who have semitic ancestry in them. A submarker of J. This is not necessarily associated with people who speak Semitic languages. -J2=Said to have started somewhere in the fertile crescent. Common throughout the Mediterranean people as well as significant markers in India. Also commonly found in people of Ashkenasi Jewish descent, due to the Hebrew origins that many people of Jewish faith have. Also a submarker of J. -E3B2=Indigenous to most north African people, again regardless of linguistic association. -L=Haplogroup most strongest throughout India thought to be of the Native population. Some sources indicate that it is a result of a mutation that took place by it's careers somewhere in north-central India. Can also be broken down into sub markers as named below and linking site. -Q=Turkic/Mongoloid/Turanoid. Not found in all Turkic speaking peoples as per the general consensus that language<< >>genetics. Q is also found amongst certain Native North American tribes, coinciding with theories & linguistic findings that some Native American tribes crossed over from North Eastern Asia into North America via Alska sometime around the Ice Age. The site gives additional details into marker L, it's distributions and it's divisions into L*, L1, L2, L1A, L2B, L3*, L3A. As clearly shown marker L (represented in black) mostly widespread in India and not Pakistan. It is only in Southern Pakistan represented by Mohajirs, Brahuis and other language groups primarily or partially of Indian descent. In the early years of independence Pakistan experienced a massive wave of Muslim immigrants migrating from North India and other parts of the subcontinent. L is also present in other parts of the world due to migration of tribes originating in present-day India. Take for example the presence of the L marker in Europe. This is due to the migration of Romany people (also known as Gypsies) from India into Europe. This is one proof that Indians and Pakistanis are not "the same" weather demographically or genetically. 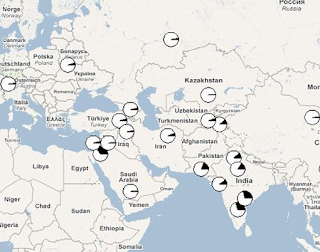 There are some shared markers, due to India and Pakistan having common invaders such as the Mughals/Mongols leaving behind their markers in both countries. Another thing to note is that the above map points out the marker L also appears to be absent in Bangladesh and Nepal, given that Indians also love hijacking Bangladeshi identity, culture & literature to elevate 'their' achievements or claiming Nepalese history as one of theirs too. Markers common to India & Pakistan and reasons for this commanlity. Aside from R1A, most genetic markers common to certain parts of India and Pakistan is due to race mixing between a common invader. R1A is a gene shared by Pakistan and North Western India due to migrations of early Indo-European speaking tribes that are said to have arrived into the subcontinent, through Pakistan and went across into North western India in ancient times. Their expansion stopped right there, which explains the limit of R1A in northwestern India. Indeed, most of Northwest Indians are a blend of these Indo-Aryan speakers alongside Native Dravidian speakers and others. Another common marker shared by certain Indians & Pakistanis is marker Q, though not very significant. It is hardly visible in both countries. It is again not due to a propagated 'common origin' of "Indians" and Pakistanis but due to historical Turk/Mongoloid/Turanoid invasions of the subcontinent. Most notably are the Huns who were said to be of Turk/Mongoloid origins as well as the Ghaznavids and the Mughals (Mongols), though these two armies had leaders of Iranic speaking backgrounds. 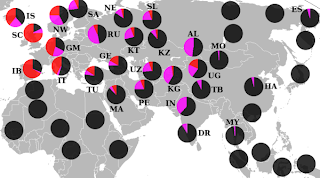 The Q haplogroup is represented in black. As stated earlier, only a small percentage of people in India and Pakistan have it. In India it's about 0.24 while in Pakistan it's about 0.74. Possible reasons for Pakistan having a higher frequency of it is due to Pakistan being the barriar between India & Central Asia and north western Pakistanis having contact with Turko-Mongol armies coming in from central Asia such as Genghis Khan's temporary rule in Balochistan as well as Turkic tribes coming towards North Western Pakistan from Afghanistan. Additionally the White Huns had a strong presence in Pakistan. Additionally there is a large Hazara community in Pakistan. The general consensus is that they are descedents of ancient Turko-Mongol tribes that settled in Afghanistan and adopted an iranic language. Their Mongoloid features support these theories. Haplogroup J1 & 2 are higher in India than in Pakistan. In India it is due to contact between the Portugese & the Arab traders particularly towards the South and surprisingly J seems to be absent almost everywhere in Pakistan save for a small fraction in Balochistan. This is probably due to close historic contact between Balochis and Omanis. THE REMARKABLE quality of this transformation is partly shown by the fact that there was no such thing as Hinduism before the British invented the holdall category in the early nineteenth century, and made India seem the home of a "world religion" as organised and theologically coherent as Christianity and Islam. The concepts of a "world religion" and "religion" as we know them now, emerged during the late 18th and early 19th century, as objects of academic study, at a time of widespread secularisation in western Europe. The idea, as inspired by the Enlightenment, was to study religion as a set of beliefs, and to open it up to rational enquiry. But academic study of any kind imposes its own boundaries upon the subject. It actually creates the subject while bringing it within the realm of the intellect. The early European scholars of religion labelled everything; they organised disparate religious practices into one system, and literally brought into being such world religions as Hinduism and Buddhism. Not only Hinduism, but the word Hindu itself is of non-Hindu origin. It was first used by the ancient Persians to refer to the people living near the river Indus (Sindhu in Sanskrit). It then became a convenient shorthand for the Muslim and Christian rulers of India; it defined those who weren't Muslims or Christians. Modern scholarship has made available much more information about the castes, religious sects, folk and elite cultures, philosophical traditions and languages that exist, or have existed, on the Indian subcontinent. But despite containing the world's third largest population of Muslims, India is still for most people outside it, a country of Hindus; even a "Hindu civilisation" as it featured in Samuel Huntington's millenarian world-view. The persistence of such labels in the West is not just due to ignorance, or to some lingering Christian fear of unconvertible heathens. Perhaps, the urge to fix a single identity for such diverse communities as found in India comes naturally to people in the highly organised and uniform societies of the West, where cultural diversity now usually means the politically expedient and hardened identities of multiculturalism. Perhaps, people who themselves are defined almost exclusively by their citizenship in the nation-state and the consumer society cannot but find wholly alien the pre-modern world of multiple identities and faiths in which most Indians still live. Certainly, most Hindus themselves felt little need for precise self-descriptions, except when faced with blunt questions about religion on official forms. Long after their encounter with the monotheistic religions of Islam and Christianity, they continued to define themselves through their overlapping allegiances to family, caste, linguistic group, region, and devotional sect. Religion to them was more unselfconscious practice than rigid belief; it is partly why Indian theology accommodates atheism and agnosticism. Their rituals and deities varied greatly, defined often by caste and geography; and they were also flexible: new goddesses continue to enrich the pantheon even today. There is an AIDS goddess which apparently both causes and eradicates the disease. At any given time, both snakes and the ultimate reality of the universe were worshipped in the same region, sometimes by the same person. Religion very rarely demanded, as it did with many Muslims or Christians, adherence to a set of theological ideas prescribed by a single prophet, book, or ecclesiastical authority. This is why a history of Hinduism, no matter how narrowly conceived, has to describe several very parochial-seeming Indian religions, almost none of which contained an evangelical zeal to save the world. The first of these—the Vedic religion—began with the nomads and pastoralists from central Asia who settled north India in the second millennium BC. It was primarily created by the priestly class of Brahmans who conducted fire sacrifices with the help of the Vedas, the earliest known Indian scriptures, in order to stave off drought and hunger. But the Brahmans who also formulated the sacred and social codes of the time wished to enhance their own glory and power rather than propose a new all-inclusive faith; they presented themselves as the most superior among the four caste groups that emerged during Vedic times and were based upon racial distinctions between the settlers and the indigenous population of north India and then on a division of labour. A NEW RELIGION WAS also far from the minds of the Buddhists, the Jains and many other philosophical and cultural movements that emerged in the sixth and fifth centuries BC while seeking to challenge the power of the Brahmans and of the caste hierarchy. People dissatisfied with the sacrificial rituals of the Vedic religion later grew attracted to the egalitarian cults of Shiva and Vishnu that became popular in India around the beginning of the first century AD. However, the Brahmans managed to preserve their status at the top of an ossifying caste system. They zealously guarded their knowledge of Sanskrit, esoteric texts, and their expertise in such matters as the correct pronunciation of mantras. Their specialised knowledge, and pan-Indian presence, gave them a hold over ruling elites even as the majority of the population followed its own heterodox cults and sects. Their influence can be detected in such Indian texts as the Bhagavad-Gita which was interpolated into the much older Mahabharata, and which, though acknowledging the irrelevance of ritual sacrifices, made a life of virtue, or dharma, inseparable from following the rules of caste. At the same time, India remained too big and diverse to be monopolised by any one book or idea. Today, the Hindu nationalists present Muslim rulers of India as the flagbearers of an intolerant monotheism; but there was even more religious plurality during the eight centuries of Muslim presence in India. Sufism mingled with local faiths; the currently popular devotional cults of Rama and Krishna, and the network of ashrams and sects expanded fast under the Mughal empire. Medieval India furnishes more evidence of sectarian violence between the worshippers of Shiva and Vishnu than between Hindus and Muslims. In the 18th century, the British were both appalled and fascinated by the excess of gods, sects, and cults they encountered in India. It was a religious situation similar to the pagan chaos a Christian from the eastern provinces of the Roman empire might have encountered in the West just before Constantine's conversion to Christianity. As it turned out, like the powerful Christians in Rome, the British in India sought and imposed uniformity. There were intellectually curious men among them: a judge called William Jones founded the Asiatic Society of Bengal, whose amateur scholars began in the late 18th century to figure out the strange bewildering country the British found themselves in. Jones, a linguist, confirmed the similarity between Sanskrit and Greek. Another official, James Prinsep, deciphered the ancient Indian script of Brahmi, the ancestor of most Indian scripts, that the British found on pillars and rock faces across south Asia, and threw the first clear light on the first great patron of Buddhism, Ashoka. A military officer called Alexander Cunningham excavated the site near Benares where the Buddha had preached his first sermon. These days, there is a common enough presumption, which was popularised by Edward Said's Orientalism, that much of western scholarship on the Orient helped, directly or not, western imperialists. Some people take it further and assert that any, or all, western interest in India is tainted with bad faith. IT WOULD BE TOO simple to say that this great intellectual effort, to which we owe much of our present knowledge of India, was part of a colonialist or imperialist enterprise of controlling newly conquered peoples and territories. What's more interesting than the by now familiar accusations of Orientalism is how the assumptions of the earliest British scholars mingled with the prejudices of native Indian elites to create an entirely new kind of knowledge about India. These scholars organised their impressions of Indian religion according to what they were familiar with at home: the monotheistic and exclusive nature of Christianity. When confronted by diverse Indian religions, they tended to see similarities. These similarities were usually as superficial as those found between Judaism, Christianity and Islam. But the British assumed that different religious practices could only exist within a single overarching tradition. They also started off with a literary bias, which was partly the result of the mass distribution of texts and the consequent high degree of literacy in Europe in the eighteenth century. They thought that since Christianity had canonical texts, Indian tradition must have the same. Their local intermediaries tended to be Brahmans, who alone knew the languages—primarily Sanskrit—needed to study such ancient Indian texts as the Vedas and the Bhagavad-Gita. Together, the British scholars and their Brahman interpreters came up with a canon of sorts, mostly Brahmanical literature and ideology, which they began to identify with a single Hindu religion. The Brahmanical literature, so systematised, later created much of the appeal of Indian culture for its foreign connoisseurs, such as the German romantics, Schopenhauer, Emerson and Thoreau. The strange fact here is that most Indians then knew nothing or very little of the hymns, invocations and liturgical formulae of the four Vedas or the philosophical idealism of the Upanishads that the British and other European scholars in Europe took to be the very essence of Indian civilisation. These Sanskrit texts had long been monopolised by an elite minority of Brahmans who zealously guarded their knowledge of Sanskrit. It was these Brahmans who educated the British amateur scholars. So they studied earnestly the canon of what they supposed to be ancient Indian tradition and managed to remain mostly unaware of the more numerous non-textual, syncretic religious and philosophical traditions of India—for example, the popular devotional cults, Sufi shrines, festivals, rites, and legends that varied across India and formed the worldview of a majority of Indians. But the texts provided the British the standards with which to judge the state of contemporary religion in India. Since few Indians at the time seemed capable of the sublime sentiments found in the Bhagavad-Gita and the Rig-Veda, Hinduism began to seem a degenerate religion, full of such social evils as widow-burning and untouchability, and in desperate need of social engineering: an idea that appealed both to British colonialists and their Brahman collaborators who had long felt threatened by the non-Brahmanical forms of religion that most Indians followed. It was equally convenient to blame the intrusion of Islam into India for Hinduism's fallen state, even the caste system, and to describe Hindus as apathetic slaves of Muslim tyrants: a terrible fate from which the British had apparently rescued them in order to prepare their path to a high stage of civilisation. These ideas about the Muslim tyrants, Hindu slaves and British philanthropists were originally set out in such influential books as History of British India, written by James Mill, a Scottish utilitarian, and the father of John Stuart Mill. Such books now tell you more about the proselytising vigour of some enlightened Scots and utilitarians than about Indian history. This article has been modified from it's original version to avoid misconceptions and inaccuracies but the full credit still goes to the author. The Pakistani diaspora is significant, around 7 million people, and contributed almost US$8 billion into the economy last year. It is composed by and large of people who only retain a connection to Pakistan via their families. Once the recipients of the remittances pass away, or as is more often the case, themselves leave Pakistan, the financial connection is severed. At this point, the Pakistani migrant takes his place in the new country, even if it means being a second-class citizen. If he is in the West, he usually defines himself as a ‘Muslim’ or ‘South Asian’ or sometimes even an ‘Indian.’ He then ceases to have a meaningful relationship with Pakistan. This depressing state of affairs is due to the identity struggle within Pakistan itself. Pakistanis abroad don't know who they are or how they should relate to Pakistan because they don't know what it means to be Pakistani. One of the principal identity-markers that Pakistanis abroad have turned to is to re-define themselves as ‘Muslim’. This has been especially true after 9/11, but pre-dates that event as well. It has been disturbing to watch and experience because no other diaspora from a Muslim majority country makes their national identity subservient to their religion – not even the stateless Palestinians. While everyone else seems to take pride in their particular national histories – even when there isn't much to be proud of – people in the Pakistani diaspora seem to run away from being associated with their country's past. As a result, Pakistanis exceed all others in becoming attracted to romanticist readings of the past – the sort extremist religious teachers are more than happy to offer up. Another popular trend among second-generation Pakistanis in the West is the denouncing of independence as a mistake. Since Pakistanis never bother learning about their country's history they delusionaly believe it was a 'part' of India. These people live in a fantasy world where 60 years of conflict with another state can be overcome in a singular moment of sublimation. What's illuminating is that Bangladeshis never talk about joining India or West Pakistan in such a manner. Indeed, the Pakistani diaspora is in a difficult place. It cannot actively participate in the discussion about Pakistani identity, but it also cannot progress until this issue is resolved. Guidance must come from Pakistan itself. There are some signs that this has started. Recently a federal minister began rolling out all sorts of incentives for Pakistanis in the diaspora. These include an overseas pension trust, a plan to protect expat properties back home, waivers of service charges and custom duties, special treatment in housing and college admissions, and finally, honorary seats in the various legislative houses. The aim would be, in the words of the minister, to "grant VIP status" to the expats. This minister's attempt to include the diaspora is worthwhile, however, the entire scheme is built upon preferential treatment, which only further enhances class differences and hierarchy between Pakistanis. It also assumes, wrongly, that simply because they have money, Pakistanis in the diaspora have a good idea about how to improve Pakistan. A political or legislative solution is neither sufficient, nor, given rampant cronyism, ideal. It also creates the danger of politicizing the overseas communities and splintering them based on political preferences. The focus at the moment has to be on culture and identity. The promotion of Pakistani arts, music, literature, cinema, poetry, and fashion is of the essence. And the answer does not lie with the venal fashion shows that are put on at sumptuous diplomatic residences, inviting only a few elite expats. Outreach has to be done within expat communities – Dubai, Bradford, Brooklyn. Scholarships should be given to traveling street-theatre artists. Films should be subsidized. Poetry, especially translations, should be promoted and put on popular websites. Instead of becoming a censor-state towards pre-Islamic culture and lifestyle, Pakistan should promote freedom of expression in these issues. Engagement with Pakistan's culture will give adrift Pakistanis around the world a sense of belonging. Effort has to be made to connect Pakistani expats to Pakistan, not via their families, but via the idea of Pakistan itself – via Pakistaniat. It is this sense of confidence that will make Pakistanis want to invest in Pakistan perhaps even return and engage in nation-building. The few successful diaspora activists that I have met have either been motivated through national emergencies such as the earthquake, or they have emerged from a cultural awareness group that was ready to do more. The first time I met Bilaal Ahmed, the founder of IMPAK USA, a service group that sends volunteers to Pakistan, was at the Philadelphia screening of the Pakistani film Khamosh Pani. Further, as I have previously documented elsewhere, the only meaningful political lobbying group ever formed to lobby the US government, namely Pakistani-American Public Affairs Committee (PakPAC), grew out of a fun-loving social organization for Pakistani doctors, who initially came together to invite poets and singers from Pakistan. There are lessons to be drawn from this. Most people think ‘diaspora’ only when they run into a Pakistani on foreign soil and want to ask about the nearest place to find chicken tikka. Diaspora is, actually, the barometer by which one can judge the health of a nation. The feeble state of the Pakistani diaspora speaks volumes.